The most famous corners in racing are all about elevation change: Eau Rouge at Spa, The Corkscrew at Laguna Seca, the Minami jump at Ebisu. 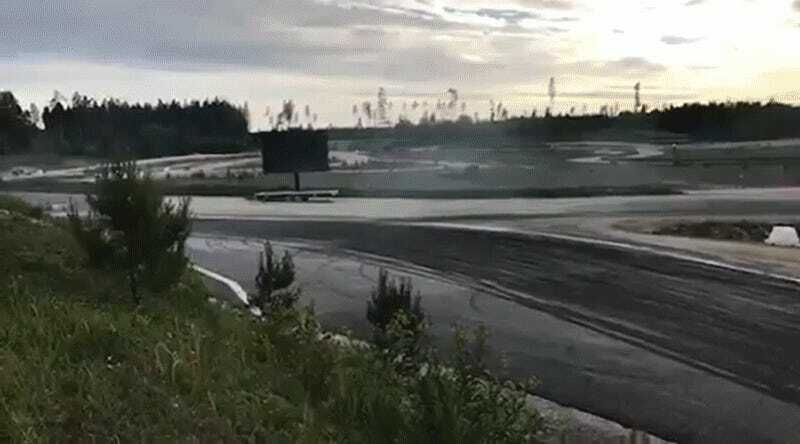 Now, please welcome the“Roller Coaster From Hell,” recently run for the first time at Estonia’s Kehala Ring. It’s not a stretch to say this running of the NEZ Drift Championship at Kehala is the wildest thing in motorsports at the moment, an absolutely gigantic drop, taken as sideways as possible, into another corner. I assumed that the moment any car took this jump, it would instantly explode on impact, along with every vertebra in the driver’s body. We just had a really cool drift event here over the weekend on a freshly finished rallycross track that featured an insane jump. It’s not the only drift event we have that has a jump (the other is at Laitse rallycross track) but this one was something else. Yeah, a few crashes, some cars couldn’t handle the landing, but overall pretty smooth sailing for how wild the track was. The one E46 wagon there was, crashed 3 times at least but still kept going. We are used to tight concrete lined tracks here and the cars are built tough. Sadly there weren’t many cars that made it to the finals but let’s hope Drift Allstars returns to Estonia and takes on this track next. Yes. Please. More jump drifting. I highly recommend watching as much of this in super slow-mo as possible. And while you’re here, watch a bunch of high-def drone footage of the jump action, as well as that E46 wagon absolutely crushing its body behind the rear wheels. America needs a good, honest jump drift. We need one so bad. Rally Truck Versus Tree. Rally Truck Wins.